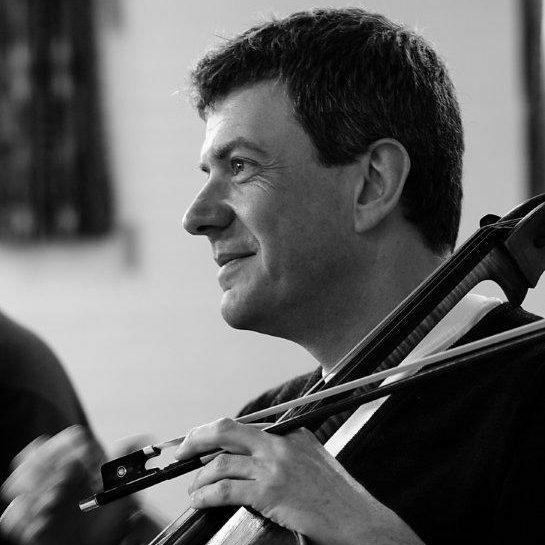 Jonathan Tunnell studied ‘cello in Manchester with Ralph Kirshbaum and Emma Ferrand and in Berlin with Wolfgang Boettcher made possible by an award from the Countess of Munster Trust. Whilst in Berlin he played with many groups including the Gruppe Neue Musik and the Berlin Philharmonic Orchestra. He also played as solo cellist with the Kammer Oper Berlin. On returning to the UK he was for seven years a member of the Brindisi Quartet with whom he recorded many highly acclaimed discs including the complete quartets of Frank Bridge which was nominated for a Gramophone Award. He now devotes his time to a wide variety of music making. He has performed quintets with the Allegri, Belcea, Maggini and Medici Quartets and has played regularly with the Academy of St Martin in the Fields and the English Chamber Orchestra. He is co-principal cello with the Orchestra of St. John’s and Principal cello with the Orchestra of the Glyndebourne Tour which he also manages. He has played as guest principal with the City of London Sinfonia, the BBC Scottish Symphony Orchestra and the Scottish Ensemble. In the commercial music world he has performed on over 300 film and television scores from Gladiator, James Bond, Harry Potter and the Dark Knight films. In the popular music world he has also worked with many top performers including Madonna, Elton John, the Spice Girls, Bjork and Oasis. He plays an Italian cello made in Venice in 1855 by Luigi Fabris. Jonathan has been ‘fixing’ London’s top freelance musicians for many different projects of all sizes over the last twelve years. As well as ‘fixing’ for the Orchestra of the Glyndebourne Tour for the past 11 years (from full symphony orchestra to chamber ensembles, working for three months every autumn) he has contracted a wide range of groups of all sizes for pop gigs and commercial work. He has also assisted casting companies with selecting musician extras for film work. With over twenty years of experience as a player he has unrivaled knowledge of top players in London and most importantly who plays well with whom! In 2018 Jonathan has also been responsible for implementing Glyndebourne’s new Pit Perfect graduate scheme for young players joining the Glyndebourne Tour Orchestra. The Tunnell Trust for Young Musicians was established following the merger of the John Tunnell Trust and the Young Musicians’ Trust in 1999. The John Tunnell Trust was formed in 1988 by family members, colleagues and friends of the late John Tunnell, OBE, the founder leader of the Scottish Chamber Orchestra. The Trust was established in order to support young musicians and chamber groups in particular. The aim of all our work is to help bridge the difficult gap between the student and professional worlds for our Young Musicians, where recognition and experience can only be gained from quality performing opportunities. In 1993 Wendy, John’s widow, set up the Young Musicians’ Trust wishing to do even more to promote young musicians. She ran the Trust almost single handed until her untimely death in 1998. The Young Musicians’ Trust promoted its own series of concerts in country houses, schools and other venues and staged an annual showcase and performance week at Strathgarry in Perthshire, Scotland whilst winning extraordinary support from many high profile sponsors. The Trust has assisted some 107 young chamber music ensembles (450 individual musicians) and 82 different Scottish Music Clubs in 668 concerts by running its Awards Scheme whereby the Trust pays the fees of outstanding young groups to play at Music Clubs all over Scotland with an emphasis on helping Clubs in small and remote places as well as in the major centres. Young groups are selected annually at auditions held in London. In addition to the Music Club Awards Scheme, the Blair Atholl Showcase, now Music Coll and other concert promotions, the Trust has always sought to publicise its Young Musicians in order to further increase their profiles.The Trust has enjoyed outstanding success. We have been able to provide much needed performing opportunities for Young Musicians at the outset of their careers and vital support for local arts and educational organisations often situated within isolated communities. As a working Trust, there is a need to raise funds annually in support of both the Awards Scheme, entering its 30th season and the Study & Performance Week, now in its 26th year. Much of our work is funded by large national charities, commercial sponsors and many generous individuals. We are extremely grateful to all those who make our work possible. Jonathan was Chairman of the Trust from 1989 until 2001 since when he has been Artistic Director. He is also responsible for all fund raising for the Trust’s activities.